With a finger monitoring the global economic pulse, Empire Aviation Group`ss executive director Paras Dhamecha is creating a regional business aviation jet giant. GCC, MENA, SA, CEA, EU, UK, USA, SEA… name a geographic abbreviation, and depending on how many customers he`s flying over its skies at any moment, Paras Dhamecha will tell you about it`s economic health. "Nigeria," for instance, "is a hotspot for business again," he says. "Most of our customers there are from the oil and gas industry, and things dipped when oil prices first fell through, as well as with the political unrest around the recent elections. But now there`s a stable government in place, so people are more comfortable flying around. We have a few planes over there right now." Former prime ministers, global celebrities, athletes, business titans, "sometimes a prized-cast of falcons," Dhamecha`s Empire Aviation Group, the Dubai-headquartered private and business jet firm he runs with his partner Steve Hartley, has flown everyone. The company operates 22 planes (it doesn`t own any of its own aircraft), in a scope of operations that covers virtually every corner of the world minus the Antarctica. "If you`re flying 200 hours on a jet each year, you might as well just buy one or explore fractional ownership even." "We have a sales and brokerage presence in the US, an aircraft operating base in Lagos, Nigeria, and then east of the Atlantic, literally from Europe all the way to Hong Kong, is where we have aircraft and operations," he explains. Still, he remains modest. "We`re a boutique operation," he says. 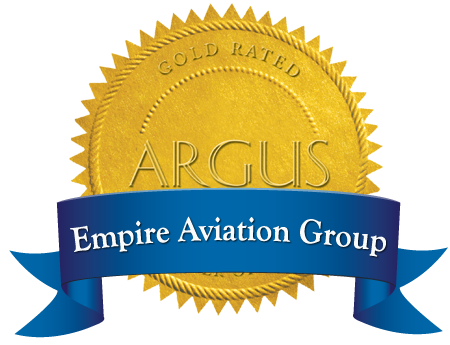 Empire Aviation Group`s position affords it multiple advantages but that need to be actively maintained, says Dhamecha. Operations spread out across the globe mean the company can weather a downturn in one region thanks to its strength in another. However, the businesses and clients the company works with "are of a size that are susceptible to any global socio-economic or political incident," he says. "So we always keep ourselves informed." Keeping abreast of the world comes naturally to the Harvard Business School alum. It also allows him to carry a unique view about the health of the business aviation market in the Middle East. "We have a very sweet spot that we`ve found," he says. In the Middle East, the buyers of jets tend to be principals at corporations who use it as a private jet, not necessarily a business tool, he says, whereas in the rest of the world a jet is used as a corporate tool. There is no doubt the current regional economic softness looks to continue into the mid-term, but it could also eventually bode well for business aviation in the future. Any resulting low-margin, high volume economic environment will mean time is of the essence for corporate executives, according to Dhamecha, and that means the busiest executives will need to look beyond commercial carriers to travel. "Agreed, it`s a cyclical market and it`s cyclical worldwide. But our ability to work globally helps us be agile, so a downturn here can be played off strength in a market elsewhere." "You lose a whole day waiting to check in, then more because you`re early or late to a meeting, and then again while waiting around for the return flight," he says. "Soon, like in Europe, the US and South Asia, businesses here will wonder why they shouldn`t send three VPs to go from Dubai to Muscat for a one hour meeting, and be back in the office by the early afternoon." Inevitably, that will spur high business aviation utilisation, and at today`s prices, Dhamecha estimates that, "If you`re flying 200 hours on a jet each year, you might as well just buy one or explore fractional ownership even." In the current environment, ultra-high net worth executives won`t change their lifestyles dramatically if their businesses need to take a slight step backwards, according to Dhamecha. And even if they were to fly less frequently, Empire assists in the offloading of private jets, just as it assists in helping owners buy them. Where most other businessmen would be hard-pressed to announce optimism, Dhamecha`s point of view could almost be considered cause celebré. But it wouldn`t, in Empire`s case be unfounded: the firm`s revenue and returns have grown by double digits year on year for the over the last few years, according to Dhamecha. "We`ve done jet deals from $1.5m to $65m," he says. "Agreed, it`s a cyclical market and it`s cyclical worldwide. But our ability to work globally helps us be agile, so a downturn here can be played off strength in a market elsewhere." "Everything is stable, and we have a very healthy business that should continue to grow." In fact, if Empire were to close all the deals it has in the pipeline, "it would be the best year for our aircraft sales business, in terms of units and returns, out of all the last eight years that we`ve been doing it." Of course, Empire has two other cards in its hand that deliver its core annuity income: asset management, which involves managing every aspect of someone`s airplane from the crew to the operation, and then the charter business that gives owners a subsidy towards their costs of administration and maintenance. Those business units also help deliver the massive boost the business gets from its aircraft sales operations. "Aircraft sales are part of a service to our management clients. Maybe more than half of our aircraft sales deals have come from servicing the clients," he says. Dhamecha frequently peppers the conversation with mentions of "fortunately", indicating he doesn`t leave things to chance. Empire`s good fortunes are the result of "hard work," he says. "But everything is stable, and we have a very healthy business that should continue to grow." "When you have groups that come in and want to cover the whole region in just a few days, there`s only one way that you can do that – with a private aircraft. "Also, an airline isn`t a place where you can sit comfortably, have a meeting or de-brief after one because you don`t know who`s sitting around you. You don`t have that problem when you fly private. You can have a meeting, discuss private business, or celebrate a victory on the way back."